WITH THE NEW SEASON IT'S TIME TO SWITCH OUT SOME OF YOUR BEAUTY PRODUCTS! THE ONE THING I WAS QUICK TO SWAP OUT WAS MY BLUSH. ONE THING I CAN'T LEAVE THE HOUSE WITHOUT DOING IS POPPING A BIT OF COLOR ONTO MY CHEEKS. IT DEFINITELY HELPS TO MAKE ME LOOK AWAKE IF MY COFFEE HASN'T QUITE KICKED IN. DUST PINK IS MY SHADE OF CHOICE DURING SPRING/SUMMER TO ADD A TOUCH OF PINK TO THE APPLES OF MY CHEEKS. BUT, FOR FALL, I LIKE TO WARM UP MY CHEEKS WITH SOME WARMER TONES. DEPENDING ON MY OUTFIT I'LL CHOOSE TO EITHER ADD A SPLASH OF CORAL, PLUM OR BURNT ORANGE. 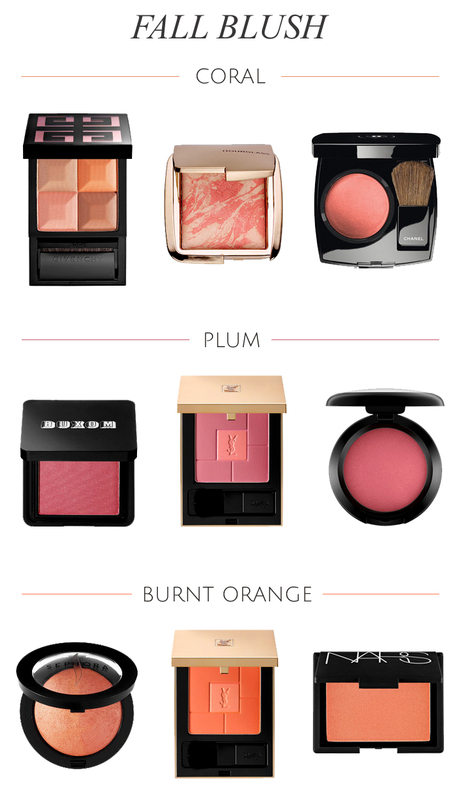 WHAT IS YOUR FALL BLUSH TONE?